Located on the beachfront of Vouliagmeni, one of the most exclusive and green coastal areas of Athens, 4-star Amarilia Hotel is close enough to the bustling center of the capital for business clients, yet far enough to offer the tranquillity of a seaside resort. 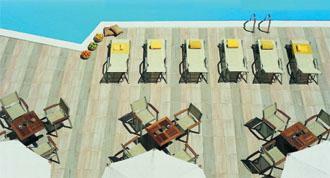 The hotel is conveniently located 20 minutes from Athens International Airport (19km) and the center of Athens (17km), 5km from the upscale Glyfada shopping center and 19km from Piraeus port. 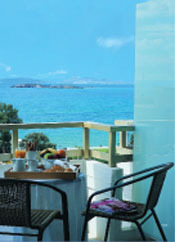 The Hotel has 95 rooms and 5 suites, all of which have private balconies with sea or pool views. All guestrooms, recently renovated, are appointed with modern amenities including, individually controlled air conditioning and heating, bathroom with bathtub, bathroom phone, remote controlled satellite TV, pay TV and radio. And for corporate guests: wireless broadband internet access, work desk, ISDN phone with voicemail and data port, electronic safe box, cordless phone (in suites) and fax (upon request). 'Artemis' restaurant (370 seats) serves a large choice of international and Greek delicacies and can satisfy all dietary needs. A wide array of cocktails and drinks can be enjoyed at the hotel's piano bar to the sounds of live music or at the pool bar. 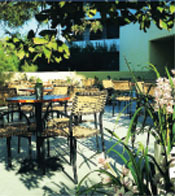 Light snacks and refreshments are served at the terrace of cafe bar "Allegro". Other amenities include 24-hour Internet point, same day laundry and dry cleaning, outdoor swimming pool, room service, car hire and travel assistance, currency exchange. The hotel has an outdoor freshwater swimming pool, while most of the popular water sports are only a few steps away at the adjacent sandy beach. A luxurious Spa & Thalassotherapy center is 50m away while a tennis club, a 18-course golf course and Vouliagmeni and Glyfada Yacht marinas are all conveniently located just few minutes away. Amarilia Hotel has 4 meeting rooms that benefit from natural daylight with a total capacity of 350 delegates, ideal for all types of business events, meetings, banquets and high level seminars, featuring a full range of audiovisual equipment. Luxurious banqueting facilities are available both indoors and outdoors. Fully aware of the pressure involved in organising a meeting or a banquet, a team of experts will take care of everything down to the last detail and ensure the success of the business or social event.